Electric Three-Hole Punch drills holes through up to 50 sheets of 20 lb. paper with the push of a button. 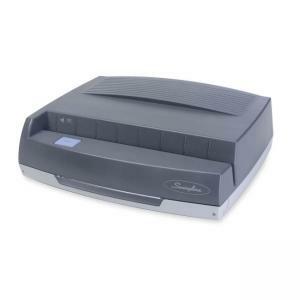 The ease and convenience of this three-hole electric punch makes operation worry-free. Built-in jam reverse function ensures smooth operation and enhances productivity. The clear window on the punch chip tray lets you know instantly when the hole punch is full. Tray slides out easily for emptying. NRTL approved.